Israeli soldiers attacked and injured, starting on Sunday evening until morning hours Monday, hundreds of Palestinian political prisoners in the Negev Detention Camp, and kept them cuffed in the cold all night long. The Palestinian Prisoners’ Society (PPS) has reported that the soldiers used live rounds, in addition to gas bombs and concussion grenades to attack the detainees, protesting the dangerously escalating violations against them. The PPS stated that at the soldiers injured at least 25 detainees, including two who suffered life-threatening wounds. It added that the soldiers handcuffed and blindfolded more than 240 detainees in Sections 6 and 7 in the Negev Desert detention camp. The Israeli army said the detainees allegedly stabbed and injured two soldiers, when the army was violently searching them and their belongings. The detainees have been protesting the installation of signal jammers around many sections of the prison, in addition to their dire living conditions. The assaults took place shortly after the soldiers attacked detainees held in Sections 3, 5 and 7 of the detention camp. The Negev Detention Camp has been witnessing serious Israeli violations and escalation, since last month, when the army installed devices to scramble TV and Radio signals. 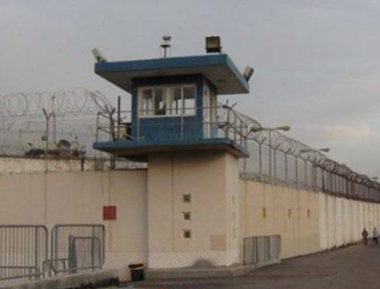 In addition, the Palestinian Detainees’ Committee has reported that the soldiers also attacked dozens of detainees in the prisons of Galboa’, Ramon, Nafha and Eshil, and assaulted them with clubs and batons. It stated that the Israeli escalation against the detainees is a war crime and is part of an ongoing illegal policy that violates International Law and basic human rights agreement. The Committee called on the international community to intervene and stop their serious violations, and escalation, adding that the violations constitute organized crimes and acts of terrorism against defenseless prisoners. It also called on various international human rights and legal groups to investigate the escalating violations, and to ensure an end to these crimes against the detainees. There are at least 1300 Palestinian detainees held in the Negev Detention Camp, which was first opened in 1988 after the First Palestinian Intifada started less than a year earlier. The prison camp was closed after Oslo peace agreement, but Israel reopened it in 2002, after the army conducted its massive invasions across the West Bank; it is located northwest of the Negev Desert, close to the Egyptian border.